Since Beginning in July of 2013 I have been was appointed chair of the Department of Government at Bowdoin College. My term as chair ends this June 30 ended on December 31, 2017 (woo hoo! ), and I am excited to return to the “back benches” of academia. One reason is below. 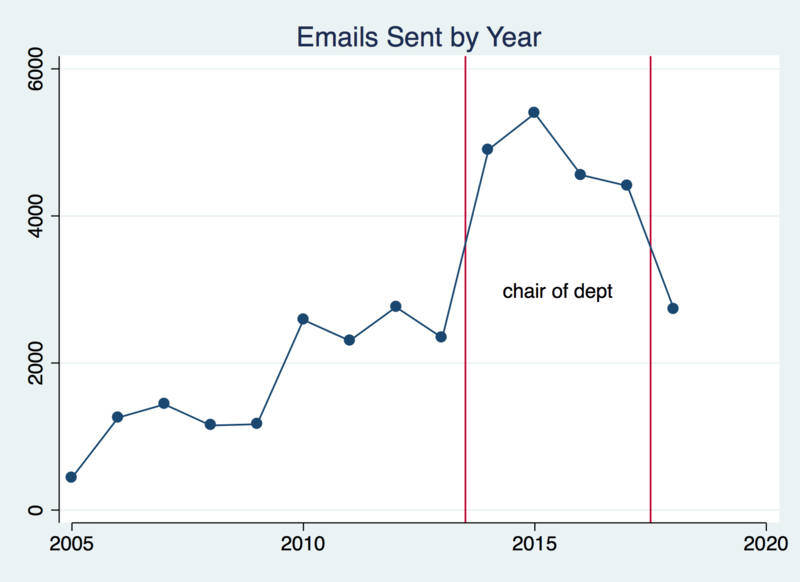 As part of my Quantitative Analysis class, I asked Bowdoin IT to send me the number of emails I have sent every day since my appointment at Bowdoin began in 2005. We are using the data as part of work to learn SPSS, Stata, and R. I aggregated these data by year. I have been was chair for three four full calendar years (2014, 2015, 2016, and 2017), and these appear to the right of the in-between the vertical lines in the graph. I have sent, on average, about 5,000 over 4,500 emails in each of those years. This is more than double my pre-chair/post-tenure years (2010-2013) nearly five times the number as assistant professor. I’m looking forward to seeing this trend drop a fair amount in 2018!